A 1,000-calorie diet is a low-calorie diet typically used for women to promote weight loss. However, this diet falls below the minimum recommended calorie intake requirements for good health and may not be an adequate source of nutrients, which may lead to deficiencies. Given the limitations of the diet, including nutrient-rich foods is an important aspect of a 1,000-calorie diet plan. Always consult your doctor before making any changes to your diet -- especially for such a low-calorie diet, which should only be followed under ongoing medical supervision. When following a low-calorie diet such as the 1,000-calorie diet, you have very little room for extras and indulgences, so you want to make sure your food choices are rich in nutrients and low in calories to get the most nutrition out of every bite. That means filling your plate with fruits and vegetables, lean sources of protein, whole grains, low-fat or nonfat dairy and healthy fats. Fitting in most of the food groups at each meal can help make sure you get enough nutrients. To stay energized and satisfied, be sure to eat at regular intervals throughout the day, every three to four hours, which means three 300-calorie meals and one 100-calorie snack. Most importantly, don't skip meals to save calories or hasten your weight loss because you may sabotage your efforts by creating an intense hunger that leads to overeating. 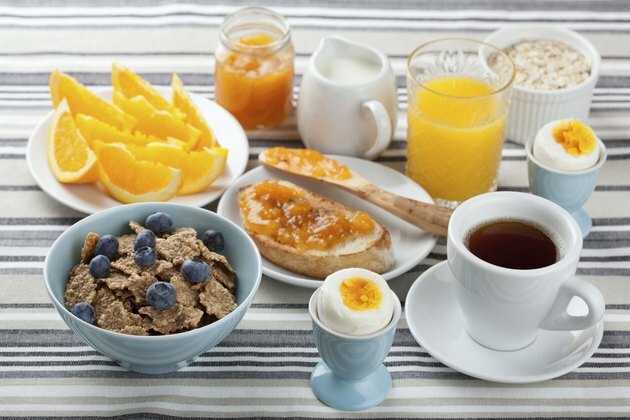 Start the day right with a healthy and filling breakfast. A good sample meal might include 1/2 cup of nonfat cottage cheese with a small banana and a slice of whole-wheat toast with 2 teaspoons of peanut butter for about 300 calories. You might also enjoy a warm bowl of oatmeal filled with 1 cup of cooked oatmeal, 3/4 cup of fresh blueberries and 4 chopped walnut halves with 1 cup of nonfat milk or nondairy alternative such as soy milk, which has 282 calories. Those with limited time for breakfast in the morning can drink a smoothie you make on-the-go consisting of 6 ounces of nonfat plain Greek yogurt, 1 cup of diced mango and 1 tablespoon of almond butter for 318 calories. Fill your lunch with low-calorie fruits and veggies to keep hunger away in the afternoon. A good lunch might include 2 cups of mixed greens topped with 2 ounces of grilled chicken breast, 1/4 cup of kidney beans, and 2 tablespoons of low-fat salad dressing with 1 cup of cubed cantaloupe and 6 ounces of nonfat Greek yogurt for 322 calories. Or, fill half a whole-wheat pita with 2 tablespoons of hummus, lettuce and shredded carrot, and serve it with 1 cup of sliced cucumbers, a small orange and 1 ounce of low-fat cheese, which has 295 calories. Two-ounces of water-packed canned tuna mixed with 1 tablespoon of low-fat mayonnaise served with 10 whole-grain crackers with 1 cup of sliced carrots and celery sticks and two plums for 315 calories also makes a healthy lunch option on your 1,000-calorie diet plan. End your day on a good note with a nutrient-rich dinner such as 3 ounces of grilled salmon with 1/2 cup of roasted sweet potatoes and 2 cups of steamed broccoli and cauliflower, which has 295 calories. A veggie stir-fry made with 1 cup of sliced carrots, celery, onions and bok choy with 1/2 cup of tofu sauteed in 1 teaspoon of vegetable oil and served with 1/2 cup of cooked brown rice also makes a healthy dinner meal at 290 calories. A 2-ounce turkey burger on a whole-wheat hamburger bun with 1 cup of mixed greens topped with 2 tablespoons of low-fat salad dressing makes another healthy dinner option with 300 calories. Snacks tide you over in between meals, so make them filling and healthy. For 100 calories, try one of these: 2 cups of mixed greens topped with 2 tablespoons of low-fat salad dressing; 14 almonds; a small apple with 1 ounce of low-fat cheese; one container of nonfat Greek yogurt; 2 tablespoons of hummus with 2 cups of sliced peppers, cucumbers and carrots or 1/2 cup of whole-grain unsweetened cereal with 1/2 cup of nonfat milk or milk alternative.